The motto of the Boy Scouts and Girl Scouts of America is "Be prepared." Robert Baden-Powell, an English soldier and the motto's creator, explained the motto as encouraging a tradition in which "you are always in a state of readiness in mind and body to do your duty." This is a lofty goal. How many of us are always prepared to do what we need to do? One could say that it is a demand that social workers and other helping professionals must always meet; that is why they are so well trained. But as this issue's cover story reports, many social workers and others say they don't feel prepared to deal with one of the most saddening recent trends—the rising suicide rate. After declining for more than a decade, the suicide rate rose 24% from 1999 to 2014, and recent high-profile people who have taken their lives, such as Robin Williams, Kate Spade, and Anthony Bourdain, have brought this trend into closer examination. The reasons are unclear but are very likely multidetermined. Until the research yields more on definitive reasons and addressing them, one thing is clear: All social workers, indeed all helping professionals, and even the general public should be prepared to help anyone who is having suicidal thoughts. Knowing the risk factors and warning signals is the first step to increased awareness and knowing what to ask is critically important. One important step has been the creation of Mental Health First Aid, an eight-hour course that gives people the skills to help someone who is developing a mental health problem or experiencing a mental health crisis. I have taken the course and I recommend it for anyone concerned about helping people with mental illness and suicide prevention. For more information, visit www.mentalhealthfirstaid.org. 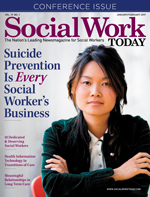 For social workers, many interviewed for the cover story recommend that social workers seek more training in suicide assessment and prevention. One expert says all licensed clinical social workers should make a personal commitment to do at least one of their three-hour CEs about some aspect of suicide risk. Others say that states need to step up and mandate CE on suicide risk assessment and that schools of social work require increased education in suicide prevention.